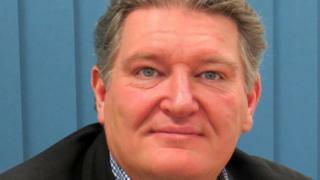 The former leader of Cheshire East Council who faced questions over his conduct has resigned from the authority. Michael Jones stood down as a councillor in Bunbury months after leaving the local Conservative group and quitting as council leader in 2015. As leader, he faced questions over the way some contracts were awarded. Mr Jones said he will now focus on plans to open a new medical education centre in Crewe. He added that his time as a councillor had "many highs and only a few lows", but earlier this year accused some party members of orchestrating a campaign against him. He stepped down as council leader in December 2015 after some Conservatives called for an external investigation over the way contracts were awarded to Core Fit Ltd, run by Mr Jones' personal physiotherapist Amanda Weston, formerly known as Amanda Morris. He denied wrongdoing after the council waived its financial rules three times to do deals with the firm. Mr Jones and Ms Weston are currently members of a consortium bidding to establish a medical education centre at the site of Crewe's Manchester Metropolitan University campus, which is due to close in 2019. Mr Jones resigned from the national and local Conservative party before votes in September and December which could have seen him suspended or expelled. "It is now time for me to move on with new ventures that will allow me to continue to support local communities, especially children, but in a less political, more open environment and with an emphasis on working together to deliver and with a transparency", he added. Cheshire Police is looking into the way the council awarded contracts as part of a misconduct in public office investigation. A by-election will be held in Mr Jones' ward of Bunbury.